Council will be asked to approve the minutes of October 11, a special meeting of council held on the 15th of this month and the minutes of the Public Works Committee Meeting of October 11. During the regular meeting, council did not approve an interchange option, in the special meeting of the 15th, council approved a $.5 M Interchange Enhancement Project by a vote of 4 to 3. During the Public Works meeting the water study was reviewed. The goal of the study was to evaluate the cost of the operation of the water plant compared to purchasing water. In the area of old business, council will hear for a second time about appointing the city manager and some staff to the Butler County and Warren County Tax Incentive Review Council or TRIC. Under new business there five emergency resolutions/ordinances and one first reading Ordinance. The ordinance deals with 'Internet Sweepstakes Cafe' regulations for Monroe. Apparently there is some interest in Monroe by at least one party wanting to locate an Internet Cafe in Monroe. Recently Middletown Council rejected this type of business due to the legality of the cafes' in relation to gambling law. According to City Manager Bill Brock, "Staff has reviewed and amended the regulations for the City and is recommending addition of the language as a part of the business regulations of the City. The Development Department will take the lead role on the enforcement of these regulations once passed. It is intended that these regulation be passed as an emergency on their second reading so that they may be in place prior to the ending of the moratorium period. We recently have had further inquiry into this type of use." The first emergency ordinance deals with street lighting assessments for Butler County. Monroe has been granted additional time to file the assessments which has allowed the city to finalize restructuring of the assessments. Previously the city spread all street lighting costs over the entire city. 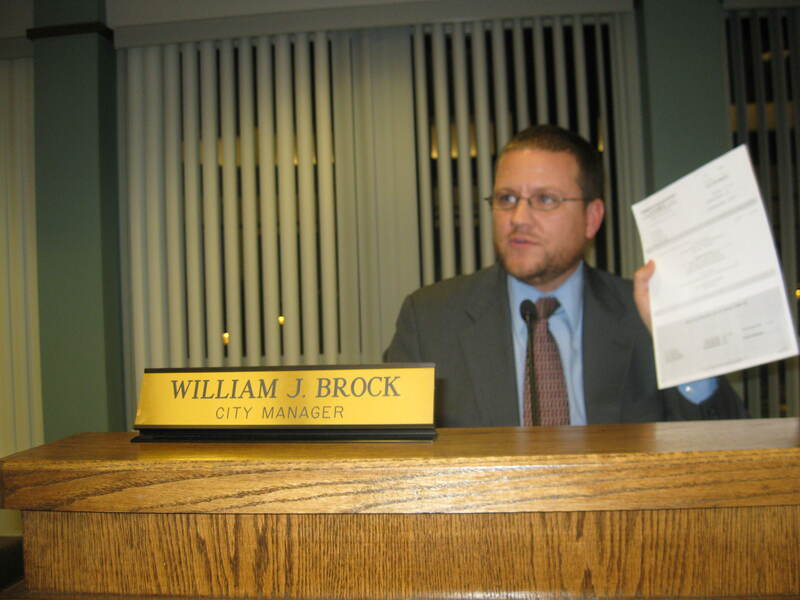 Brock said, "Council had determined that this may not be the fairest distribution of those costs. City staff has worked with Duke on the project that now allows us to assess the costs of lights within a neighborhood directly to the benefiting properties within that neighborhood. Certain lights within the City along more widely used routes, such as Main Street and SR63 are still charged across all properties in the City." Warren county is also allowing Monroe to amend a previously filed report. The next two emergency resolutions deal with collective bargaining with the Ohio Patrolmen's Benevolent Association for the patrol officers and sergeants. There are proposals on the table ready for approval by council. The contract allows for no increases to base wage rates in the first and second year of the contract, but does allow for a re-opener in the third year of the contract. The contract also increases to 17% over its life the cost the employee contributes to health care. The next emergency resolution deals with a recommendation by the Ohio Municipal League (OML) and was requested by council according to City Manager Bill Brock. The resolution title reads, A RESOLUTION OPPOSING THE STATE OF OHIO OR ANY OTHER THIRD PARTY CENTRAL COLLECTION ENTITY FROM SEEKING TO TAKE CONTROL OF MUNICIPAL INCOME TAX COLLECTION AND DECLARING AN EMERGENCY." The next emergency resolution is requesting a Then-And-Now certificate for $12,757.50. Pillar Valuation Group was retained to prepare expert witness reports in relation to the SunCoke litigation. These reports will be used in our legal defense. Lastly according to City Manager Bill Brock, "We have received a request to farm the acreage behind the Route 4 Firehouse. We are asking Council to approve the advertising of said parcel for such purposes. Once bids are received we can evaluate the benefit and Council will have the option to accept the bid. Lastly scheduled is administrative reports. Approval of the Minutes - Council Minutes of October 11 and October 15, 2011 and Public Works Committee Minutes of October 11, 2011.